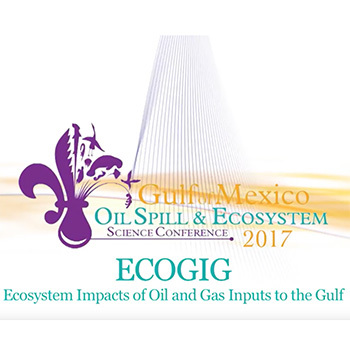 ECOGIG conducts multi-scale, multidisciplinary research to study the impacts and fates of oil and gas released in offshore waters of the Gulf of Mexico. Video by Gary Finch productions, 2017. 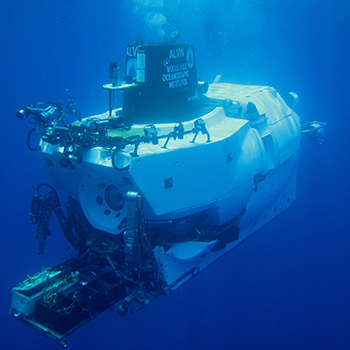 Scientists aboard the research vessels R/V Endeavor and E/V Nautilus briefly describe the nature of the work of ECOGIG. Video courtesy of Gary Finch Productions. 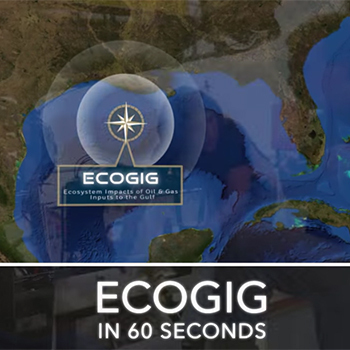 A look into the research being done by ECOGIG in the Gulf of Mexico. 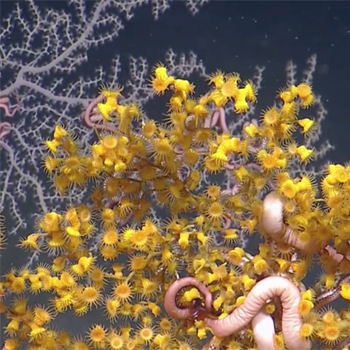 Video courtesy of Ocean Exploration Trust (nautiluslive.org). 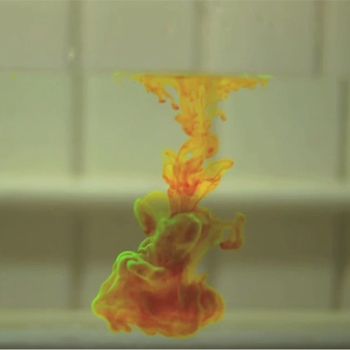 How does oil affect deepwater ecosystems? 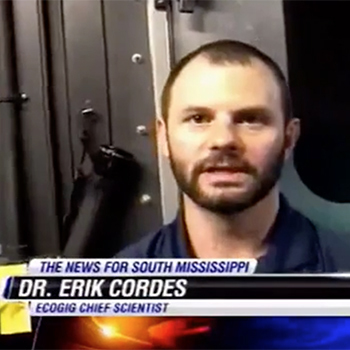 Dr. Erik Cordes (ECOGIG) answers questions about how oil spills affect deep water ecosystems during a cruise aboard the E/V Nautilus. 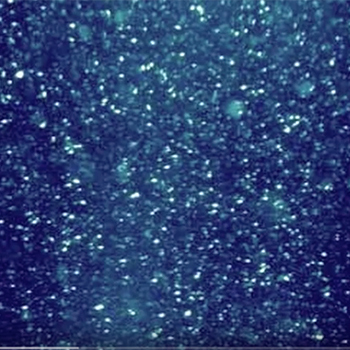 Video courtesy of Ocean Exploration Trust (nautiluslive.org). 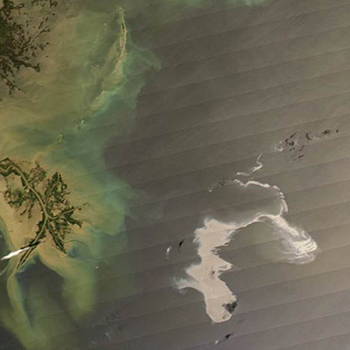 Dr. Ian MacDonald and Dr. Ajit Subramaniam describe their work monitoring the health of the Gulf of Mexico via remote sensing. Video courtesy of Gary Finch Productions. 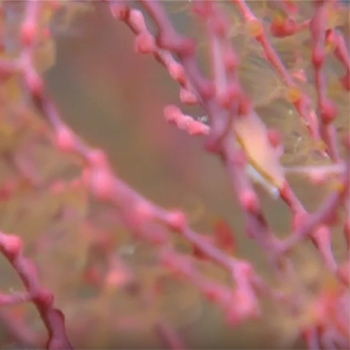 Dr. Chuck Fisher describes his research examining the fascinating and long-lived deep sea corals impacted by effects of the Deepwater Horizon explosion. Video courtesy of Gary Finch Productions. 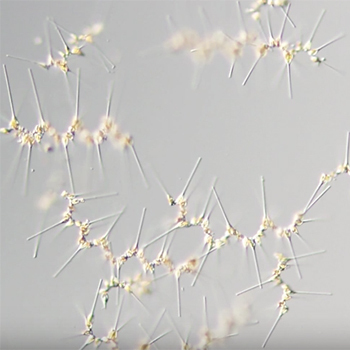 Dr. Jeff Chanton and Dr. Ian MacDonald explain their complementary work exploring the possibility that hydrocarbons from oil have moved into the Gulf food web. Video courtesy of Gary Finch Productions. 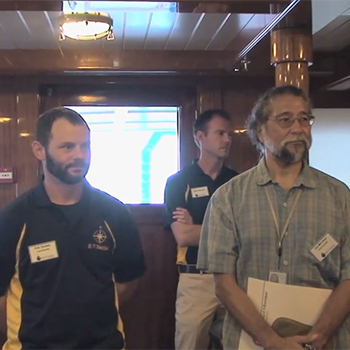 Dr. Joe Montoya, Dr. Andreas Teske, Dr. Samantha Joye and Dr. Ian McDonald describe their collaborative research approach during preparations for the Spring 2014 cruise aboard the RV/ Atlantis with research sub ALVIN. Video courtesy of Gary Finch Productions. Dr. Uta Passow describes research she and her colleagues Dr. Arne Dierks and Dr. Vernon Asper conduct on marine snow in the Gulf of Mexico. Video courtesy of Gary Finch Productions. 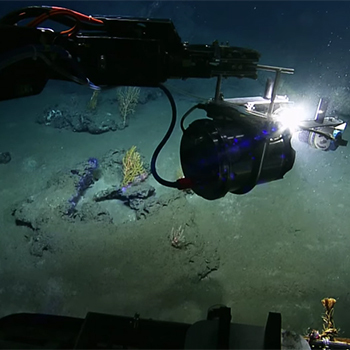 Dr. Chuck Fisher describes the use of ROVs in researching deep sea corals, and Ocean Exploration Trust's Dr. Bob Ballard explains the powerful impacts of ROVs in STEM education. Video courtesy of Gary Finch Productions. 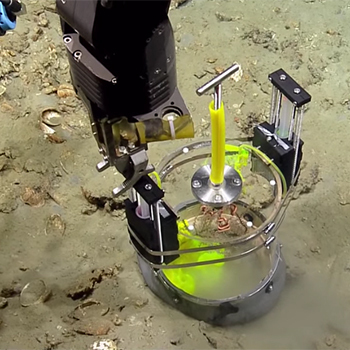 Scientists describe the crucial importance of ALVIN submerisble dives (deployed from the R/V Atlantis) in assessing the ecosystem impacts of the Deepwater Horizon accident. Video courtesy of Gary Finch Productions. ECOGIG coordinated two research cruises in the Gulf of Mexico in July, 2013. 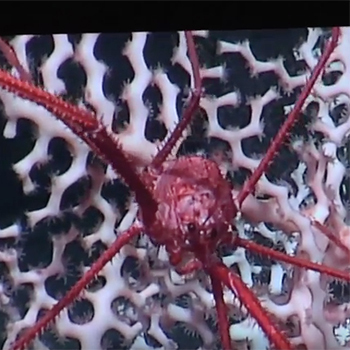 The chief scientists of those cruises, Dr. Joe Montoya and Dr. Erik Cordes, talk about the value of their coordinated work, with images of deep sea creatures and equipment. Video courtesy of Gary Finch Productions. 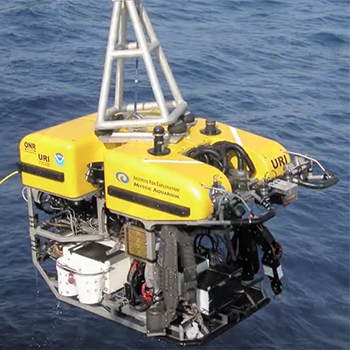 Hear scientists aboard the R/V Endeavor and E/V Nautilus tell about their research in the Gulf of Mexico. A group of about 20 representatives from local media outlets, the Gulf of Mexico Research Initiative, the Stennis Space Center, the Port of Gulfport, and the University of Mississippi visited with ECOGIG scientists returning from a rare tandem cruise to study oil and gas seepage in the Gulf of Mexico in 2013. 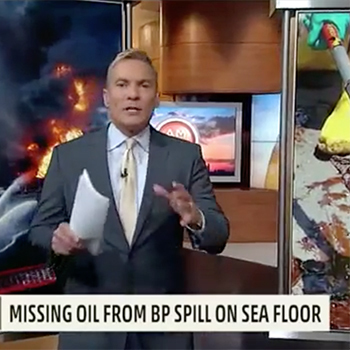 ECOGIG researchers find 6-10 million gallons of Deepwater Horizon missing oil, part 1 of 2. "This is going to affect the Gulf for years to come," ECOGIG's Dr. Jeff Chanton, lead researcher and a professor of chemical oceanography at Florida State University, states in this Weather Channel interview (part 1). Dr. Chanton and his co-authors recently published a paper of their research findings on this topic featured in the video, which you may read here. 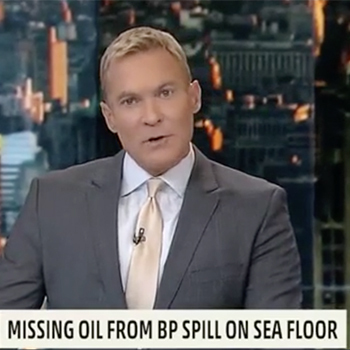 "This is going to affect the Gulf for years to come," ECOGIG's Dr. Jeff Chanton, lead researcher and a professor of chemical oceanography at Florida State University, states in this Weather Channel interview (part 2). Dr. Chanton and his co-authors recently published a paper of their research findings on this topic featured in the video, which you may read here.